Last Sunday presented a beautiful day with clear and sunny skies along with cool Ocean breeze over the Rising Sun Turf Club. Turfites packed the stands and grounds to enjoy a day of thoroughbred horseracing as the 2nd leg of the Triple Crown meet created new champion horses and jockeys. Jamaican bred Lucky Star from the S. Cheefoon stables outran Storm Bird, Red Rocket, Vera’s Finally & TNT to claim the $1M purse in the 1400m C3 & lower class feature race. 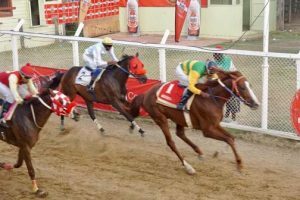 Jockey Rinaldo Appadu had the mount for this and two other wins on Miss Olympic in the L Class 1100m & J Class 1400m making him the champion jockey for the day. Fans got a bonus history lesson in the process. Rising Sun Turf Club owner, Insanally ’Sunny’ Habibulla celebrated his 86th birthday by taking in the races at his tracks. Habibulla remains one of the patriarchs of the D’urban Park race track era. Ninety one-year-old, Abdul Latiff, also a patriarch of the D’urban Park racing days recalled that his current home in Bel Air Park sits on what was once horse stables and paddocks where he and his horses trod in the 1940s after he had left his home town in Skeldon, Corentyne, to ride at the then D’urban Park race course. Habibulla has the honour of being the last standing horse owner/trainer at D’urban Park, while Latiff is the only known surviving Guyanese jockey who rode at D’urban Park race tracks. Special guest at the races was Guyanese-born Derek Chin, owner of the Movie Towne franchise. Derek’s father, Sammy Chin, was a horse owner well known to Latiff and on Sunday, Chin and those present were treated Latiff’s vivid memories and minute details of his father’s racing days.